Summer is hot and wonderful and sticky and sunshiney and full of awesome. Coffee, likewise, is all of those things (except maybe sticky, depending on how much sugar you add). But sometimes…the two don’t mix. I love coffee and hot drinks as much as the next person, but I don’t exactly envision myself chilling out on my deck, reading a book in the intense summer heat, reaching for a steaming hot, soul-warming cup of joe. Naw! You gotta ice that sucker. And as much as iced macchiatos from Starbucks are lovely and divine, they add up. Solution? Make your own coffee concentrate, that you can whip into an awesome iced caffeinated beverage anytime your little heart desires. 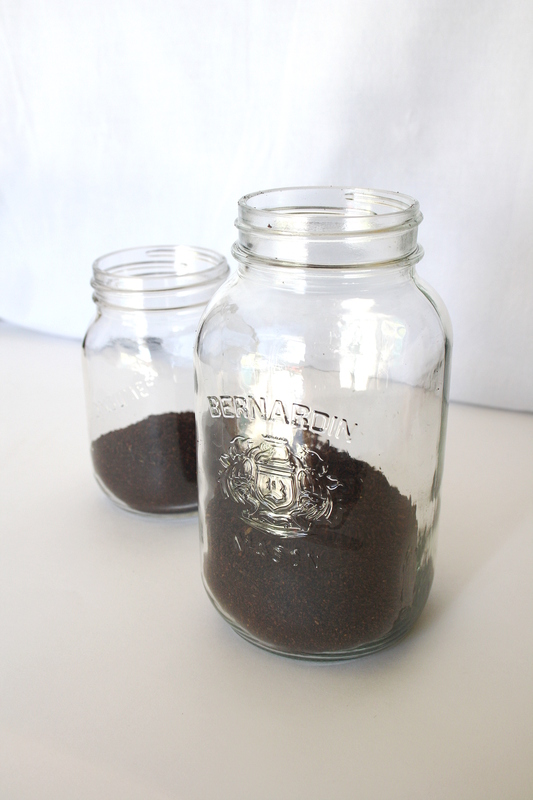 placed over another large jar, and pour the mix through the coffee filter, which will, obviously, filter out the grounds. Now you’ve got awesome homemade coffee concentrate! This stuff is pretty potent, so unless you want to see time stop around you, I recommend diluting it with some cold milk, water, sugar — whatever it is you prefer in your iced coffee. I’m bad, so I like to make coffee ice cubes. Delish. Tell me your cold brew coffee drink recipes! I’m going to give this a go!